When you attend an NEWH OC networking event you build valuable business relationships. 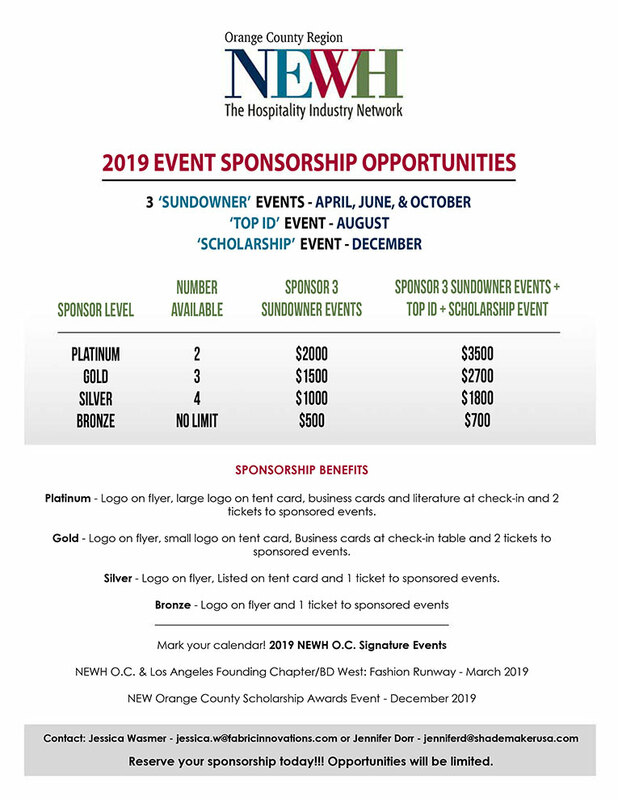 When you sponsor an NEWH OC event you help to promote and fund scholarship by helping us to grow our membership. When you offer to sponsor or give a CEU for NEWH OC, you are giving back to the design community by bringing them vital educational programs. When you get involved with NEWH OC you have access to opportunities for personal leadership development by being active on our committees and participation in the NEWH Leadership Conference. When you “give back” with your time, financial resources and knowledge, you give NEWH OC and your peers the opportunity to recognize you and celebrate your accomplishment. Let’s work together to build the Orange County Regional Group. Orange County is a major force in tourism and hospitality. The OC is home to many distinguished architectural and interior design firms involved with hospitality projects around the world. We are more than the sleepy suburb of Los Angeles. Orange County was shaped by visionary Philip Stanton who brought his plans for a resort town to rival Atlantic City to Huntington Beach in 1904. The city was named for Henry Huntington who brought his Pacific Electric railway to the area. Thus began the tourism industry in Orange County.